I don’t know him personally, but I like how he thinks about our industry. In the latest issue of CIO Insight magazine from Ziff Davis Media, Larry Bonfante (CIO, US Tennis Association) writes that “Enterprise Infrastructure is Really About People.” For those who follow this occasional blog, my sentiments should not be a surprise – since 2004, when I first published the proposition that WE are the platform, I’ve been explaining the fundamental relationship between our information systems and the people that build/support them. So many of my colleagues (all of them good and smart women and men) focus solely upon the technology, only to find themselves mired in “fire fights” (Larry’s term) or relegated to non-strategic roles in their organizations. Technology challenges are simply matters of time and money. For exceptional compute environments, we must begin with exceptional people. For transformational IT, we must first transform our organizations. Larry Bonfante is on to something (we even have the same publisher), and though my list of Things To Read is long, I might just buy his book. The simplicity of our metaphor (we reflect ourselves in the systems that we build; as such, to transform our information systems, we must transform the organizations that design, build, and maintain them) was immediately embraced by this engaging and articulate group of Navy leaders. Though many at the dinner seemed to believe that their particular difficulties with institutional technology were more complicated than could be addressed by such a “catch phrase,” they asked challenging questions in order to better understand these principles and how they might be applied in specific circumstances. I’m inclined to share two of the many conversations I had with these Navy captains and admirals, not to over-simplify their very complicated technology environments, but to serve as examples as we strive to apply what we know to what we don’t yet know. Executives “glaze over” when asked to understand the technologies of two-factor authentication or deep packet intrusion protection. However, they understand in great detail the risks of illness, and our various tools that can be used to address them. A thermometer costs $9.98 and effectively identifies a fever that can be addressed by ibuprofen. Magnetic Resonance Imagery (MRI) is much more expensive yet effectively identifies a mass in an organ that would require even more expensive oncological treatments. There is a risk-reward ratio that tells us it is ineffective to treat brain cancer simply with ibuprofen, and similarly ineffective to treat the common cold with radiation. As parents, we make such decisions every day. By asking the executives to understand the risks inherent in underfunding intrusion protection, and the consequences of providing the funds only for ibuprofen, they will be able to better understand the nature of the challenge and its proposed response. Example 2: We are convinced that a broader data search will yield more valuable results than the simple search being recommended, yet our executives don’t understand the complexity of tiered/virtualized storage. Imagine that you are organizing a yard sale to yield some profits from your attic that is filled with no-longer-needed posessions. You could simply provide your own used items for sale, or you could spend the time coordinating a neighborhood-wide yard sale on the assumption that there may be even more valuable items forgotten in the basement of the people who live down the block. How do you convince them to allow you to look through their basement, possibly discovering an old (inherited) painting that they didn’t remember, but could bring a substantial profit at your yard sale? It is delicate diplomacy, requiring trust and an additional amount of administrative trivia, but the larger value to the entire neighborhood is compelling. As I explained at our dinner last night, I do not mean to diminish the urgency or complexity of current technology initiatives. On the contrary, applying this metaphor and understanding its human-centric components may add many complications we’d rather not confront. There is no right or wrong – businesses have many constraints. However, the application of the metaphor (and its resulting change in behavior) reduces the risk of miscommunication, and helps everyone understand the objectives in a more participatory way. This becomes more complex, over time. Yet there are fewer surprises (setting expectations) and less blame when projects exceed their initial timelines or cost structures. By this, I am not suggesting that the Net is simply an immense (Borges-like) storyline with myriad plots, characters, and authors. It is, however, a useful metaphor in the examination of several principles inherent in the system/mirror theorem. As I was writing the initial drafts of the book, I included some referential URLs to Ted Nelson’s website discussing his notion of “zzstructure.” Though the embedded link was “dynamic” on my system, it lost this interactive quality as the chapter was moved through Wiley’s production process, and in the published book, the referenced URL is a “static” string of text. What happens if/when Ted’s website is updated (while the book is in production) and the newer content no longer reflects – and perhaps contradicts – the text in which the URL was originally referenced? And what can we learn about this period of “uncertainty” during which the static link points to a location which is shifting? It is an issue underlying any interactive site, even this one. I pose these questions on July 5, and they may not be read until days/weeks later. In the interim (when “uncertainty” allows for all possibilities) the world itself may be transformed by the slouching progress of history. It is this interim period, this uncertainty zone, that challenges our notions of linear narrative, that underscores the essential difference between the Net and the Book, between hypertext and the printed page, between what you are reading now (about the book) and what you cannot read (the book itself) until August 7. I find this “uncertainty zone” compelling and mysterious. It is the realm of all possibility, until choice (yours/mine) sculpts the next, very real, event and presents it for our observation. With thanks to muniwireless.com and Microcast for inviting me, I participated in a panel discussion about the role of the CIO in municipalities (both small and large) and their various status reports on the progress of wireless initiatives in their cities. Of course, their stories were compelling: Atlanta, Walla Walla, the big and the small, trying to find the right balance of funding and leadership to provide their cities with the userful services they most need. Their systems were mirrors, and even the structure of their city governments reflected the principle: Chicago (strong mayor framework) just published an RFP that required 7 months to prepare; Phoenix (City Manager/Council framework) has far less difficulty because their governance model is already diffuse (de-centralized). While my private sector experience is primarily at the Federal level (Federal CIO Council, The World Bank Group) the echo of this book's main theme in the rollout of municipal wireless initiatives was clear. Indeed, as our emerging technologies become increasingly diffuse (community-based content, service-oriented architectures) the prime theorem becomes increasingly important to understand. During my research of Quantum Computing, there were numerous references (both direct and indirect) to a more complex understanding of Time. Peter Lynds' work, in this regard, is quite compelling, and will certainly influence my next Mirror book. And certain new discoveries are stunning in their own right: 30 miles from where I was born, a research group at the University of Illinois at Urbana-Champaign, led by Paul Kwiat, built a "quantum computer made of mirrors" that can give an answer before the question is posed. Rather, in more accurate terms, they were able to find the outcome of an algorithm without running the algorithm at all. I will reserve, for a later posting, my detailed theories about non-chronological Time (an attempt within a narrative to connect Here and Now with There and Then). My reason for raising the issue of Time at this juncture is to highlight a sequence reversal caused solely by the contrasts between the digital world (this blog) and the physical world (the book). It is now June 14, and I am posing – in these early entries – my most recent thoughts about Metaphor, Time, the mirror in systems, etc. You are reading these new statements before you have read the book (which is not due in stores until August 7). Therefore, before you read Page 1, it is possible for you to know my notions that I had not formulated when I wrote Page 1 two years before. In fact, you will be coming to Page 1 with more knowledge about my thinking (on issues such as Metaphor, Time, etc) than I had when I wrote Page 1. How will this non-chronological experience of these principles influence your comprehension of them? Does it, in fact, benefit you to know "C and D" before you are told about "A and B?" It is an abstraction of the process of Time, allowing for the knowledge of something that has not yet been discovered, allowing for a narrative (fiction) to describe something that has not yet occurred (thus, imaginary) until it occurs, at which point, it becomes fact. This is the literary analogy of Heisenberg's Principle of Uncertainty (until a result is measured, all possibilities exist simultaneously) that influences several characters in the book and leads them to make dramatic changes in their lives by the end of their chapter, though, if you learn of the change in this digital forum, it will not be a surprise when you read about it in the book itself. You can know the future of a character before her present circumstances lead to that future. It is as if the answer was known before the question was posed. Quantum computing. During an interview yesterday about this book, I was asked about the role of metaphor. There are many. What I find most compelling in business (and in life) are those truths that apply in more than one discipline. Calligraphy and Swordsmanship. Shiva's dance and the movement of the planets. Why our neighborhoods, from an aerial view, look so much like the circuit boards in our computers. There is a significance to those synchronous pairings beyond the listing of facts in recipes, formulas, textbooks. For this reason, systems theory fascinates me as it equally applies to disturbed children and dolphins (Bateson), social policy and informatics (Braman), and provides clarity as we consider the transformation of our networks, which must coincide with the transformation of the organizations that build and maintain them. 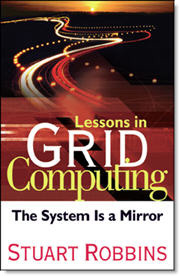 Yet, in yesterday's interview, I forgot to mention the most obvious metaphor evoked in The System is a Mirror: the book itself (the writing, production, and marketing of the product) and even its framework (presentation layer, middleware, and foundational systems) is a metaphor for how we should be designing, building, and utilizing the emergent IT services. Our information systems (cell phones, PDA's, laptops, cable boxes, routers, and all of the data flowing through them) are becoming increasingly complex. We will, therefore, increasingly rely on the efficacy of metaphor to explain this complexity in a manner that expands, rather than constricts, our dialogue. It is that subtle transmutation that happens inside the mechanism of metaphor (straw turned to gold, water turned to wine) that offers any chance of explaining ourselves to each other, to investors, to customers. It occurs to me that the "hardened" nature of books, so evocative for those of us who remember the Dewey Decimal System and so ancient for anyone who was text messaging before they learned how to drive a car, prevents the two-way exchange of communication. Naturally, my initial presentation of the book at the conference yesterday was similarly "hardened" in that it was a one-way information flow. Before the next conference or reading, I want to remodel the content to invite rather than stifle interactions. As Geoff Moore indicates in his Foreword to the book, "…Finally, I cannot resist the observation that if ever a book called for blogging, it is this one. Books that initiate lines of thinking complete themselves in the dialogs they engender." As such, the book is only the beginning of the conversation. The stories, and the characters in them, may come alive over time, in this forum and others. Paradoxically, it is the blog that comes first – then you may investigate the book itself, already turning things around on a publishing industry which, though gracious to me, relies on a product that simply takes too long to get to market. Geoff, are you out there?